Not lovely bathrooms, not closely mown grass, not a clubhouse, not even a playground. No what you need is a a stream or fast flowing shallow river, or perhaps a lake with a small lake beach. My favourite is a stream. Honestly, you can’t beat it for kid entertainment. 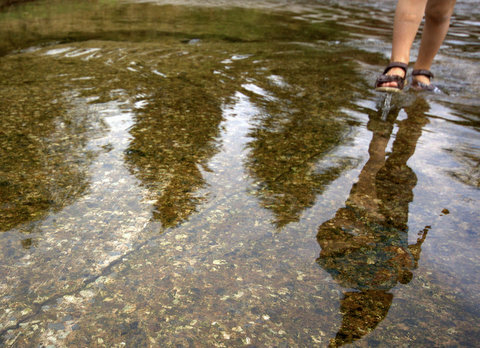 First, there is the soothing sound of flowing water. Unbeatably relaxing for both adults and children, you are winning already. Next the endless play opportunities. *Dam the river, how deep can you make the pools, make little bridges over the stream with large stones, alter the course of the stream, split it into several streams. Should they eventually grow tired of the naturally occurring play opportunities of the stream you might consider making a mini raft. All you need is a penknife and string. When play is finally over and the children are feeling completely at home in their environment, try asking them to just sit quietly and see if they can get a taste of simple tranquility. Perhaps some wildlife will stop by. A dragonfly, a fish, an otter or river bird. Next time they come back to that spot, rest assured the play will start all over again. Next, the ropeswing. Beats me why every campsite with a decent tree doesn’t have one. For some reason they are far more exciting than just your average swing. Perhaps because they are a bit unpredictable and a bit of a challenge. Maybe that connection with the beautiful, leafy, giant entities that beautify our land. I don’t know but I am certain that a scruffy bit of rope hanging from a tree will quickly attract a swarm of eager kids in a way that your average swing never will. If you are lucky to hit upon a site with both of these ‘facilities’ you are certainly onto a winner. These are a few of the campsites I’ve found that have lovely playable streams. Of course they are all campfire campsites too! 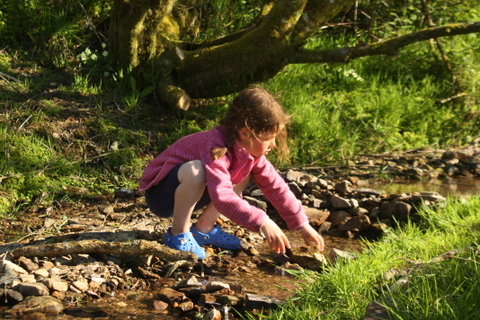 * Crocs (or the non branded alternatives) are a properly handy bit of kit for kids when camping and for stream play they are invaluable! If you know of other campfire campsites that have good streams, shallow rivers or some great ropeswings do leave a comment and share the joy! 6 Great campsites in Pembrokeshire! Top Tips for Family Camping! Brilliant selection, although whenever we’ve been, the stream at Burnbake has been significantly more mud than babbling brook :-). Our kids love a good ropeswing. Thanks. I have seen that one but not been, is it lovely? We used to spend hours down by the brook in our village as kids. And there was a rope swing…I was the one who fell in! Definitely agree that they’re essential and a great draw for kids. Oh, I wish we had a stream and ropeswing near our house. Oh well, just have to keep camping! A really helpful post full of lots of information and suggestions. 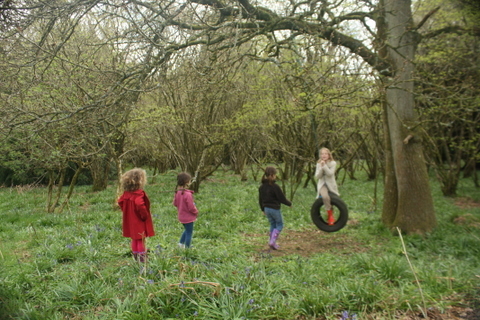 I fully agree that nature provides such a great playground for adventure and creative fun what else could you need, thanks for sharing with Country Kids. yes a stream provides hours of imaginative fun, much better than electronics. Looks like lots of reasonably priced fun was had. I would second Lower Milton….lush, gorgeous and laid back. Noongallas, above Penzance, would tick nearly all of your boxes too. And Runnage Farm, in the middle of Dartmoor. Nearly went to Noongallas this year, diverted to some slightly better weather! Def go there one day. Runnage is high on my list too and Lower Milton I will def be trying next year as it is pretty local to me. Thanks for the tips! We have a small stream at Wardley Hill Campsite and campfires are a must!